For the martial artist, see Gunnar Nelson (fighter). Gunnar Eric Nelson (born September 20, 1967) is an American musician, singer, and songwriter and international multi-platinum recording artist. Nelson is the son of teen idol Ricky Nelson and actress Kristin Harmon. He is the identical twin brother of Matthew Nelson, and brother of Tracy Nelson and musician Sam Nelson. His paternal grandparents were Ozzie Nelson and Harriet Hilliard from the television program, Ozzie and Harriet. His maternal grandparents were football player and sports broadcaster Tom Harmon and actress/model Elyse Knox. His maternal uncle is actor Mark Harmon. Gunnar Nelson married Lila Kersavage on October 7, 2014. The Nelson brothers spent two years learning how to write songs and, in the process, met their mentor, Los Angeles record producer Marc Tanner. Tanner and the twins wrote what would become the triple-platinum After the Rain album in 1990, after being signed to Geffen Records in 1989. Their singles, "(I Can't Live Without Your) Love and Affection", "After the Rain", "More Than Ever", and "Only Time Will Tell" all held positions on Billboard's Top 40 with "Love and Affection" reaching #1 in September 1990, after receiving airplay on MTV where they also had #1 videos. When "Love and Affection" reached the #1 position on the charts, the Nelsons landed in the Guinness Book of World Records as the only family to have #1 records in three successive generations (their grandfather, Ozzie Nelson, had a #1 hit with "And Then Some" in 1934, and their father, Ricky Nelson, had #1 hits with "Poor Little Fool" in 1958 and "Travelin' Man" in 1961). However, as the British music magazine, NME, pointed out in October 1990, this feat was also achieved by Red Foley, Pat Boone and Debby Boone. Yet, because Pat Boone was the son-in-law of Red Foley, the Nelson family still holds the Guinness Book of World Records as Ozzie Nelson, Ricky Nelson, and Matthew Nelson and Gunnar Nelson are of the same bloodline family. 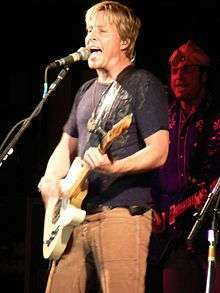 Gunnar Nelson co-founded the Stone Canyon Records label with his brother in 1995 after leaving Geffen Records. He released thirteen albums on that label. Gunnar Nelson plays a variety of musical instruments, including the drums, electric and acoustic guitars, mandolin, piano, and bazouki. He has toured extensively with Peter Frampton and Styx, as well as performing full band shows and acoustic duos with his brother. The headline shows included their own hits, as well as those of their late father. A live album, Like Father, Like Sons, featured Ricky Nelson's hit songs, as well as a tribute song they wrote to their late father called, "Just Once More". "Just Once More" was featured on CBS' daytime drama, The Bold & the Beautiful in a Valentine's episode aired in February 2006. He also sings the theme of Team Chaotix in the video game Sonic Heroes. In 2005, Gunnar Nelson became a cast member of Celebrity Fit Club (US TV series) 3, after actor Jeff Conaway left due to drug related problems. In June 2015, Gunnar and his family appeared on ABC Television's Celebrity Wife Swap opposite Vince Neil of Mötley Crüe. Besides Celebrity Fit Club 3, both twins have hosted and appeared on numerous E! and VH1 television programs. Gunnar Nelson was the co-host of the nationally syndicated radio morning show, Lifetime Radio for one year with Jones Radio. Gunnar and Matthew Nelson released a new rendition of "Jingle Bell Rock", on Razor and Tie Record's Monster Ballads Xmas album, for Christmas 2007. The Nelson brothers previously collaborated with Razor and Tie on the Monsters of Rock and Monster Ballads albums. In May 2007, they released a new rendition of their father's #1 hit, "Travelin' Man", on a limited edition compilation album, A Song For My Father. In addition, Gunnar has assembled the celebrity rock band, Scrap Metal. They planned a tour with famous leading frontmen of 1980s and 1990s bands such as Kelly Keagy of Night Ranger and Eric Martin of Mr. Big. Nelson appeared on VH1's 100 Greatest Songs of the 90s with his twin. Nelson's #1 hit "(Can't Live Without Your) Love and Affection" was voted and ranked #96 in the special, honoring the 100 greatest hits of the nineties. Nelson released the song "Rockin' Little Roadster" on the Cars soundtrack. In 2008 Disney asked him to record another song "Band In A Van" on the follow-up CD with Fred Mullen. In February 2011, NELSON released the 'Lightning Strikes Twice' album on the Frontiers label. In May 2015, NELSON released the 'Peace Out' album on the Frontiers label. In November 2015, Matthew and Gunnar Nelson released the original self-penned single 'This Christmas' to adult contemporary radio. As of December 10, 'This Christmas by Matthew and Gunnar Nelson (featuring Alyssa Bonagura) Charted in Billboard's AC Radio charts at #17, and #6 on the Holiday charts, putting Matthew and Gunnar Nelson in the top 20 for the first time in 20 years. In December 2015, Matthew and Gunnar Nelson released the 'This Christmas' album on their own Stone Canyon Records label. Gunnar continues to tour worldwide with his brother Matthew and their diverse brands of live shows: NELSON, Scrap Metal, Matthew and Gunnar Nelson (an evening with), Ricky Nelson Remembered, and Christmas With The Nelsons. ↑ Tobler, John (1992). NME Rock 'N' Roll Years (1st ed.). London: Reed International Books Ltd. p. 477. CN 5585. 1 2 "Matthew and Gunnar Nelson". Thenelsonbrothers.com. Retrieved 2016-02-25. ↑ "WME Entertainment". Wma.com. Retrieved 2016-02-25. ↑ Fred Mollin. "Disney - Cars - Lightning McQueen's Fast Tracks". Amazon.com. Retrieved 2016-02-25. "(Can't Live Without Your) Love and Affection"